Hey Curvies! 3 more days till Christmas. I'm really excited but I'm just not ready for Christmas, I still need to buy few more gifts and do a lot of wrapping. How bout you Curvies are you 100% ready? bet you aren't as well.LOL. Time just goes by real fast. Sad to say It's time to end Curveella's 2014 Christmas Holiday outfit inspo special. Ending it with a real simple "Plains and Print" look. It's between a casual and dressy style.I played around plain red and blue palette and added a pop of print. 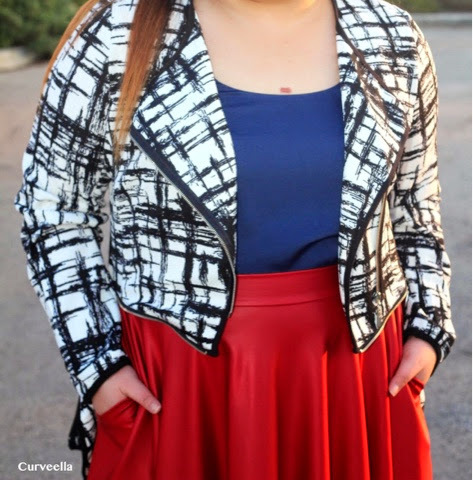 Focused between these gorgeous faux leather christmas-yy red midi skirt and B & W printed blazer both from one of my favorite plus size shop CURVACEOUS BOUTIQUE. They have a huge selection from their Holiday Collection. 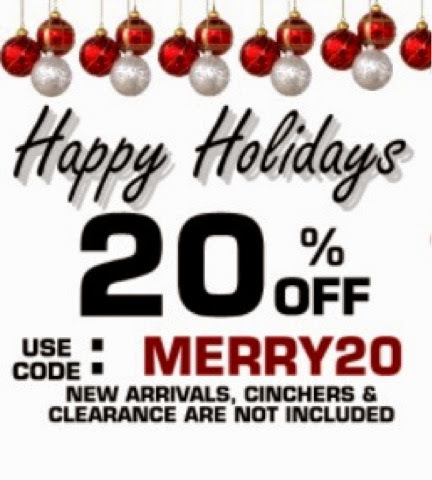 Check them out + Discount code below!